Family Home Health Care Centre is in Palmerston, Ontario. Sherry-Lynn (Owner and Operator) is a registered practical nurse who is very passionate about helping others. Her new location since September 2016 on the main street in Palmerston, has received much support and positive feedback from the community including Doctors, Hospitals, CCAC, Nurses and Therapists. Sherry-Lynn believes in team work and is pleased to see everyone working together to help others. She is a certified fitter for compression stockings, Mastectomy Prosthesis and bras which are available in the store. Bruno’s Elite Indoor and Elan Straight chairlifts offers worry-free access and the premium design blends in with your home’s environment. Consider options such as power swivel seat and power folding footrest to customize your Bruno Elite stair lift to match your unique situation. Our range of stairlifts come with an extensive range of custom options to ensure that not only is your stairlift designed to meet your needs, but that it also looks great in your own home. Ask about Power Folding Footrest, the Variety of Upholstery Choices, the Power Swivel Seat and Power or Manual Rails. Call and speak to one of our friendly team who will discuss the benefits and solutions offered with a Bruno stairlift. Once the specification is agreed, we will setup your installment and take care of all arrangements. Stay up to date with our blog entries! 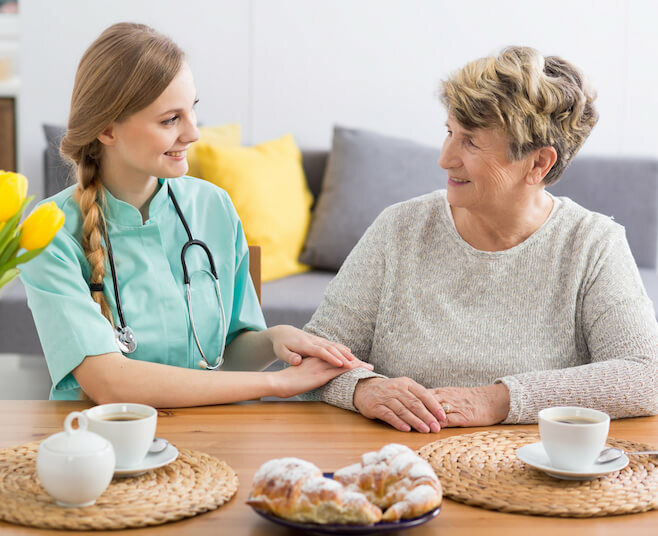 Our blog pro­vides gen­eral infor­ma­tion and dis­cus­sion to promote understanding and knowledge about home health and caring. Call today for a “free “ in-home assessment. Do you have a mobility issue and need help accessing your home safely? We may be able to help. Come in and talk to one of our friendly staff. We carry a variety of mobility aides including Bruno stair lifts. With easy installation of a start lift you can have access to all levels of your home safely. We specialize in a personal service to help seniors live well at home thanks to our knowledge of solutions. Our client satisfaction rate is important to us, come visit our new premises and see us today! We are available during normal working hours to provide you with options to improve their homelife. We partner with industry experts and professionals to ensure the best service for your loved ones. Sherry-Lynn is experienced in providing professional advice promoting a healthy mind, body and spirit. Our new Centre has a great range of products to select from, always in stock. We are known for our compassionate and caring one to one advice in difficult situations. Price Check Guarantee, we will match any competitive, reasonable quote within 15 days. Our mission is to provide personalized, high quality customer care on an as-needed or preventative basis. We have created a business that we believe in and choose for our own family members. We are a full-service staff who are dedicated, experienced staff who believe in working with customers to maintain and improve their health. We work together to serve your entire family for all mobility and medical needs, in all stages of life. We also believe in educating our customers as we work with them. We have an assorted array of mobility products, including installation of stair-lifts and grab bars so that you can stay in your home. We also carry medical, health & wellness, spiritual and foot care products. If we don’t have what you are looking for, we would be more than happy to order it for you. These people are fantastic ! When I broke my leg in two places with no weight bearing allowed for three months , they helped with everything ! They had everything we needed, commode wheelchair, walker, arm extenders , exercise pedalling device , and an absolutely terrific attitude ! Nothing was too much trouble. They have an amazing array of healthcare supplies. I visited in-store today for the first time and was so impressed with both the products offered and the kind young woman, Sherry-Lynn. For anyone with health, mobility, post surgical issues, she has something that can probably make your life more comfortable. Make a special trip to Palmerston to visit the “ Family Health Care Centre “. I bought this product because I had cracked heels and nothing worked. I used the products every day for 2 weeks and my cracks are ALL GONE!!! I used the full first bottle daily until finished and picked up one more. This is the first time in my last 10 years that my heals don’t have cracks. LOVE this product. It works and it’s worth every penny. I recommend this to all my friends. Copyright © 2017 - Family Home Health Care. All rights reserved.